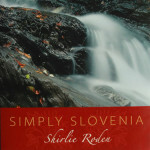 Genre : From the Simply Slovenia/Preprosto Slovenija book project, this CD is a compilation of tracks originally released as the Vanishing Lake CD (featuring guitarist Hugh Burns and Rod Edwards on keyboards, produced by John Miller) plus five new tracks arranged by and recorded with top Slovene producer Tomaz Kozlevcar. It illustrates twenty years of travelling between two countries and two cultures for Shirlie, but feeling completely at home in both, from a Green Dragon on a Ljubljana bridge to a cradle in an old Karst house, a mountain top panorama and a magnificent waterfall deep in the country and the children’s song ‘Kako Lepo’. Why have I never heard any of this before? I love "Vanishing Lake" and "Turn on the Good News" especially! GREEN DRAGONS ARE BRINGING ME HOME…. AI, AI, AI, AI, ZELENI ZMAJ, TOGETHER WE FLY ETC. Copyright: The Singing Earth Music Company Ltd.
NOW ALL WE NEED IS A MAN! BUT SUDDENLY I’VE GOT THAT FEELING AGAIN….. BUT SOMEHOW I’M DISHING THIS UP WITH MY SONGS…..
ZELENA SOLATA, OH WHERE ARE YOU NOW? MY STOMACH IS RUMBLING AS LOUD AS A COW…. BUT WHY OH WHY CAN’T I FORGET THE SWEET TASTE…. The Singing Earth Music Company Ltd.
“But you know, before you can love the earth, before you can love the trees and the plants and the animals or any living thing, there’s one person you have to learn to love first. How do you say ‘yourself’ in Slovene?” “Sebe.” “Sebe? Can we really love ourselves? We can try! THAT I MARRIED YOU IN OLD STANJEL? OOH, OOH, WATER OF LIFE….OOH OOH, WATER OF LIFE…. Copyright The Singing Earth Music Company Ltd. Copyright: The Singing Earth Music Co. Ltd.
Music: Shirlie Roden: Copyright The Singing Earth Music Company Ltd. Copyright The Singing Earth Music Co. Ltd.